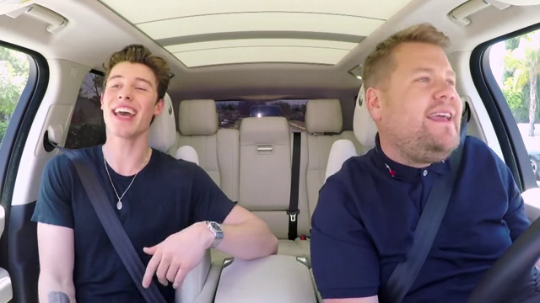 Driving through the city of Los Angeles, James Corden brought Shawn Mendes along for his commute to sing, dance, and even play a little ice hockey. The duo started their ride with one of Shawn’s most popular and upbeat summer tunes, “There’s Nothing Holding Me Back,” before segueing into his most recent life update: he moved out. Shawn is no longer living with his parents – he has his own apartment in Toronto — but he admitted he still relies on them for a lot of things. In fact, his mom still insists on coming over and helping him out. “The thing is, she won’t let me [clean my own house].” From there, they dove into Shawn’s recent hit, “In My Blood,” a song that details his struggles with anxiety. Award-Winning Brand: Mitsubishi earns title for the fastest-growing luxury brand in the U.S. Someone gave James a tip that Shawn has a tiny obsession with Harry Potter. On a 10-point scale, with 10 being an obsession, Shawn rated his interest own in Harry Potter at a 9.5. He even has a notebook at home where he used to write down all of the spells. Of course, his obsession took hold of his appearance during the episode. As he discussed his love for magic and spells, a lightning-shaped scar appeared on his forehead along with round spectacles and Gryffindor robes. The shtick went even further when Shawn switched over to a full-out Dumbledore costume, beard and all. Shawn showed off his vocal abilities even further with “Treat You Better,” adding a handful of runs into the mix. Once the song ended, James asked, “What’s the most Canadian thing about you?” Shawn replied that he used to play ice hockey, and since James had never even tried it, they decided to give it a try.